More than 1.6 million people have been evacuated from their homes. 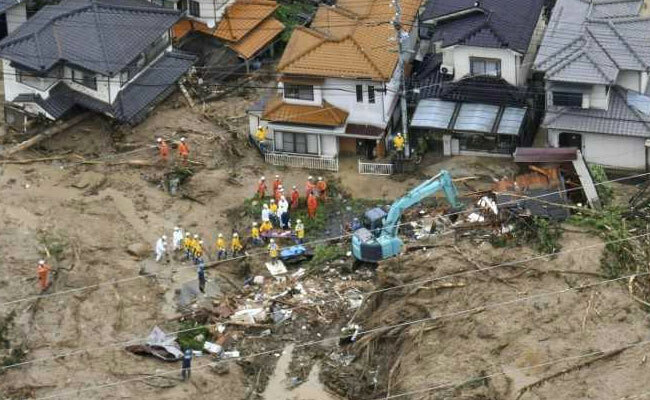 At least 45 people are missing as torrential rains that have killed 11 people, pounded western and central Japan, the media reported on Saturday. Japan’s Meteorological Agency issued special weather warnings across four prefectures in the west of Japan’s main island of Honshu. It urged vigilance against landslides, rising rivers and strong wind amid what it called “historic” rains. The agency said that although a weather front had settled between western and eastern Japan, there was a risk that heavy rains would continue as warm air flowed towards the front areas already saturated. A man in the far western city of Hiroshima died after falling off a bridge into a river. Meanwhile, a 77-year-old man in Takashima city Shiga prefecture, was killed after being swept into a canal as he worked to remove debris, media said. Two other people were feared dead after being found in buildings hit by landslides, media said. Chief Cabinet Secretary,, Yoshihide Suga, said around 48,000 police, fire fighters and members of Japan’s Self-Defence Forces were responding to more than 100 landslides and other appeals for help. By Saturday morning, more than 1.6 million people were ordered to evacuate their homes, amid fears of flooding and further landslides. A further 3.1 million were advised to leave, the Fire and Disaster Management Agency said. Some transport was affected in the southern-most main island of Kyushu. Wide parts of the expressway were covered with soil and landslide debris in the north of the island, the Kyodo news agency reported.